Provide Sworn Translation Services in Indonesia for Bahasa Indonesia English Chinese Japanese Korean German Arabic Thai Vietnamese Russian Spanish French Dutch Italian. About us is we undergo constant training and adopt the latest technology to keep our skills up to date and maintain our professional service. About us is we only use qualified human translators for our work ensuring the natural flow of language and constantly create documents which are easily understood and clear. - The best Bahasa Indonesia English Chinese Japanese Korean German Arabic Thai Vietnamese Russian Spanish French Dutch Italian translation at reasonable price. - Meeting the set deadlines constantly. - Superior customer service and fast responsiveness. 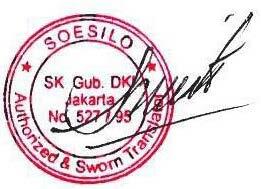 About us, we began this business in Jakarta Indonesia as a small translation company in 2010. Initially, having provided basic translation services we have steadily grown to be an enterprise with an international client base from all parts of the world. We have catered the following languages: Bahasa Indonesia English Chinese Japanese Korean German Arabic Thai Vietnamese Russian Spanish French Dutch Italian for translation needs of a range of clients such as multi-national business entities, professionals such as lawyers, doctors and professors and regular clients. Building relationships of mutual trust and gaining customer loyalty and satisfaction is a priority in our business. Overall, we assure that the customer feels that a service beyond expectations is achieved and that an excellent value for investment has been obtained. Our constant corporate growth justifies the value of our business philosophies. Anyone can claim to be a professional translator. After all, the translation profession is not regulated. An individual's educational background only counts for so much. An individual's experience only counts for so much. References may sound impressive, but may not be genuine. A translator must be familiar with the material and have affinity with the language. In this unregulated world, "cheapest" is not necessarily "best". The translation must be thoroughly checked and proofread. And this is where we separate the Good from the Bad. Some agencies carry out this procedure better than others.